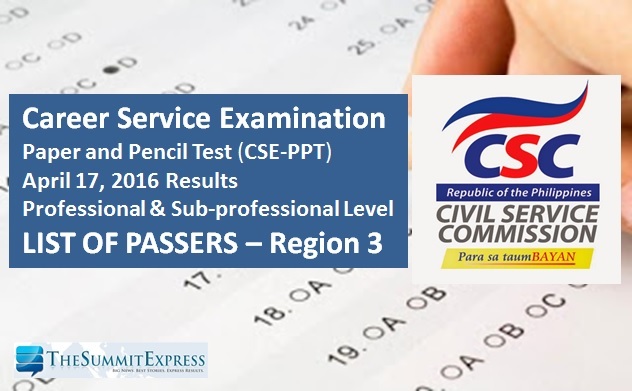 The Civil Service Commission(CSC) officially released today the results of April 2016 Civil Service Exam - Paper and Pencil Test (CSE-PPT) known as the career service exam. Check out on this page the list of passers for professional and sub-professional level. CSC said that 1,253 of the examinees in Region 3 (Central Luzon) passed the professional level exam. Below is the full list of successful examinees for Region 3 (Aurora, Bataan, Bulacan, Nueva Ecija, Pampanga, Tarlac, Zambales) civil service exam (CSE-PPT) professional and sub-professional levels.